Voice prosthesis device is an artificial device for laryngectomized patients to help them speak. The voice prosthesis is placed in the opening created between the food pipe and the windpipe which is called a tracheo-esophageal puncture (TE puncture). Globally, development of efficient and advanced technology, rise in the awareness among people, increasing government initiatives across the globe, growing usage of minimally invasive ENT procedures, and increasing prevelance of laryngectomized patients are the prime growth drivers of the voice prosthesis device market. In addition, an increase in adoption of voice prosthesis device in emerging economies such as China, India and others, will create new opportunities for the voice prosthesis device market. However, higher cost of the research and development, and higher cost of voice prosthesis device are the key restraints for the voice prosthesis device market. Geographically, North America dominated the voice prosthesis device market, with approximately half of the world’s procedures being done in the U.S. because of high medical reimbursement facilities, and technological advancement. Asia Pacific is projected to have the fastest growth, owing to a rapidly increasing aging population, rise in consumer awareness, growing incidences of laryngectomized patients, favourable government policies, modernization of healthcare infrastructure, and growing medical tourism industry in developing nations such as China, and India in this region. Among all the application, the hospital segment has the highest market share in the voice prosthesis device market due to higher prevalence of laryngectomized patients. This report identifies the voice prosthesis device market size for the years 2014-2016, and forecast of the same till the year 2022. 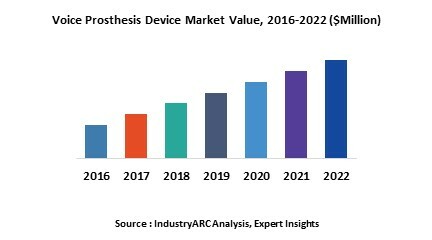 It also highlights the market drivers, restraints, growth indicators, challenges, and other key aspects with respect to the voice prosthesis device market.